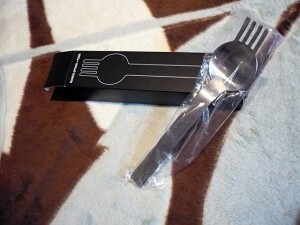 This “spoon + fork” is used at popular Sugakiya ramen restaurants in Japan. It was specially created for Sugakiya’s 60th anniversary project by Masami Takahashi from MASAMI DESIGN. 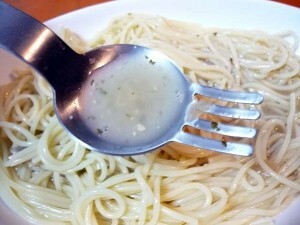 With the utensil, you can eat noodle with the fork part, and dip soup with the spoon part. 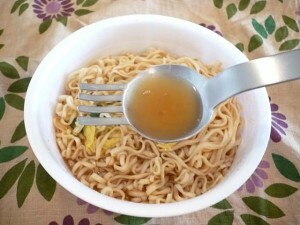 There is also a smaller one for kids or to eat desert. 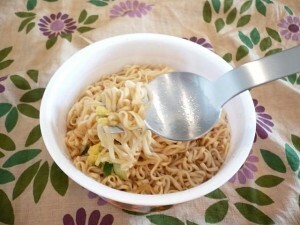 Since 1978, similar utensil had been used at Sugakiya restaurants, but it was for only right-handers. In 2007, Masami Takahashi redesigned it for both right and left handed people, and also she designed it clean and stylish. 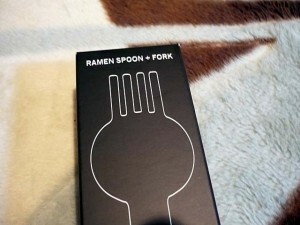 This “spoon + fork” is sold at MoMA (The Museum of Modern Art) store, and it is said to be very popular item.